A broad, all-encompassing look at the chef as a manager, examining the roles of leadership, management, training, and supervision. 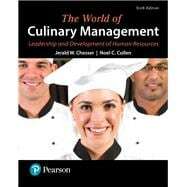 The World of Culinary Management: Leadership and Development of Human Resources, 6/e, one of the only texts designed for human resource management from a culinary perspective, gives aspiring chefs the foundational knowledge and skills required to lead, supervise, and manage food service workers. It outlines in clear terms those elements crucial to success in today's quality-driven foodservice industry, with in-depth exploration of the roles and responsibilities of a successful food service manager. The text examines all aspects of training, providing practical discussions on essential management skills and functions. The new edition incorporates new time-sensitive information about issues such as the Affordable Care Act issues of diversity, and addresses women culinary industry leaders. Jerald Chesser, Ed.D., CEC, CCE, FMP, AAC, is an internationally recognized speaker, author, and educator. He is a Professor at The Collins College of Hospitality Management, California State Polytechnic University-Pomona, one of the top hospitality management programs in the United States. Before entering academe and consulting, he spent more than a decade in restaurant operations, including ownership of a successful restaurant and off-premise catering company. He has taught at the high school, community college, and university levels. Dr. Chesser’s consulting has included the Disney Development Company, Copeland of New Orleans, University of Alaska, National Restaurant Association, and American Culinary Federation. He teaches, researches, and consults in the areas of leadership, human resource development, and the culinary arts. His previous publications include The Art and Science of Culinary Preparation. Dr. Chesser earned his doctorate in leadership at the University of Central Florida. He has earned certification by the National Restaurant Association as a Food Management Professional and by the American Culinary Federation as an Executive Chef and Culinary Educator. Dr. Chesser has received numerous honors including membership in the National Restaurant Association Educational Foundation’s College of Diplomates,the American Academy of Chefs, the ICHRIE Chef Herman Briethaupt, and the Research Chefs Association Lifetime Achievement awards. Noel C. Cullen, Ed.D., CMC, AAC (1948-2002) was one of 58 American Culinary Federation Certified Master Chefs in the United States. He had over 30 years’ experience in food service/hospitality as an operator and educator including executive chef, manager, university professor, and administrator. Dr. Cullen was the first chef in the United States to earn the prestigious level of CMC and a doctorate in education. Dr. Cullen was a member of the American Academy of Chefs and past president of the American Culinary Federation.